The new Land Tamer amphibious trailer gives the added cargo capacity of up to 5000 lbs on both land and water. It was designed with a goose neck hitch so it could be pulled behind the Land Tamer 6×6 or 8×8 RAV with Water Propulsion System attached. This is truly a heavy hauler and more than doubles the cargo capacity of the LT 6×6 or 8×8 XHD so all your cargo can be hauled in one trip. In addition, the tires on the trailer can also be tracked up for soft terrain conditions as needed. 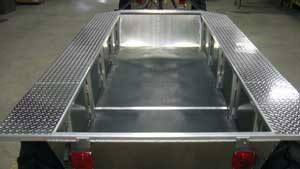 With rubber tracks installed the trailer has a full load capacity of 5000 lbs and ground pressure of the trailer would be slightly less than 3.0 psi. 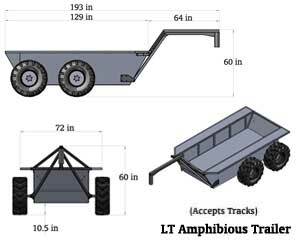 The nice thing about the amphibious trailer design is that some of the weight of the trailer is transferred to the Land Tamer utility vehicle pulling it which gives extra traction. 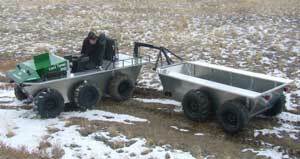 The Land Tamer and amphibious utility trailer can be turned up to 100 degrees of each other without interference. The Land Tamer and trailer can easily be backed up and maneuvered in tight places. Fully enclosed cab to haul 10-12 people or used as a mobile office at your remote location.